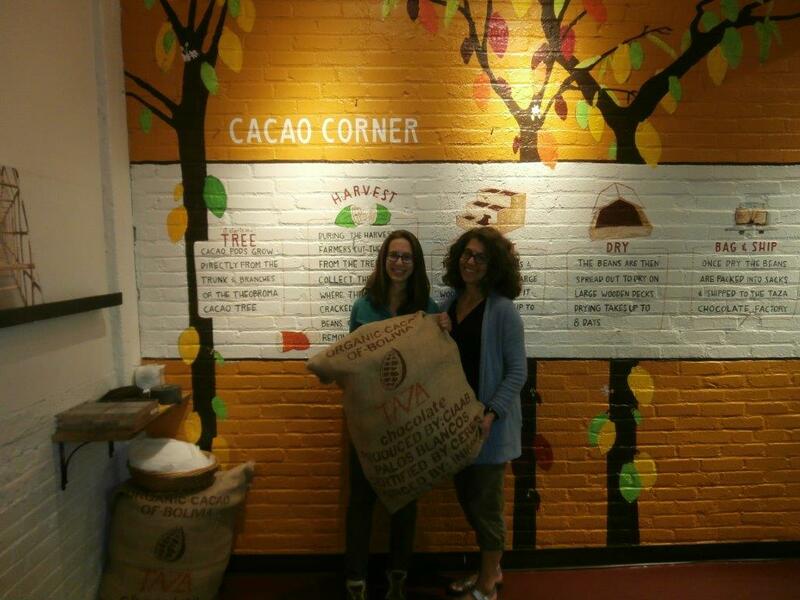 Recently, my daughter Hilary and I participated in the factory tour of Taza Chocolate, located in Somerville, Massachusetts. Taza is the only American company to make Mexican-style disk-shaped chocolate, which all of us on the tour were very excited to sample. 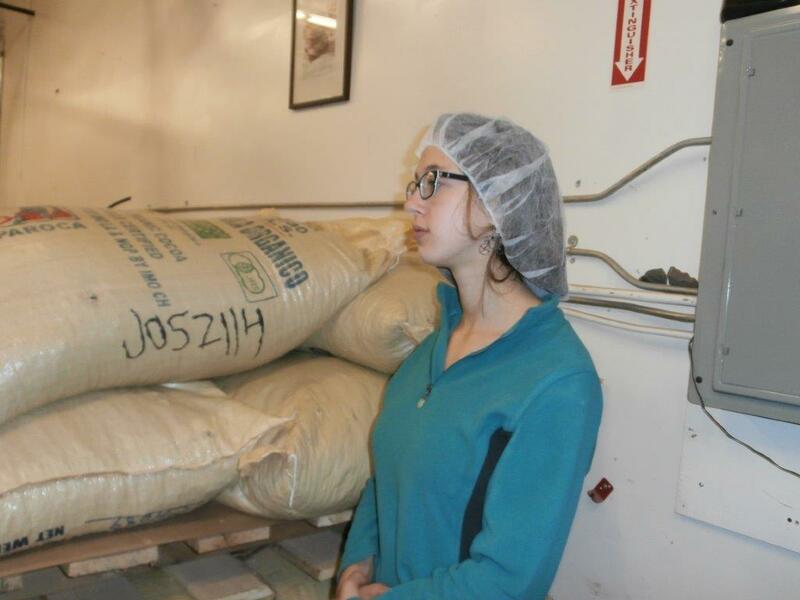 After assembling in the Cacao Corner, our tour group listened to our Tour Lead, Krysia, describe Taza's history. We learned that Taza started in 2007 with three employees and now has 60. When its founder Alex Whitmore started the company, he roasted his cacao beans with coffee-roasting machines at J.P. Licks, a local ice-cream company, during its off hours. 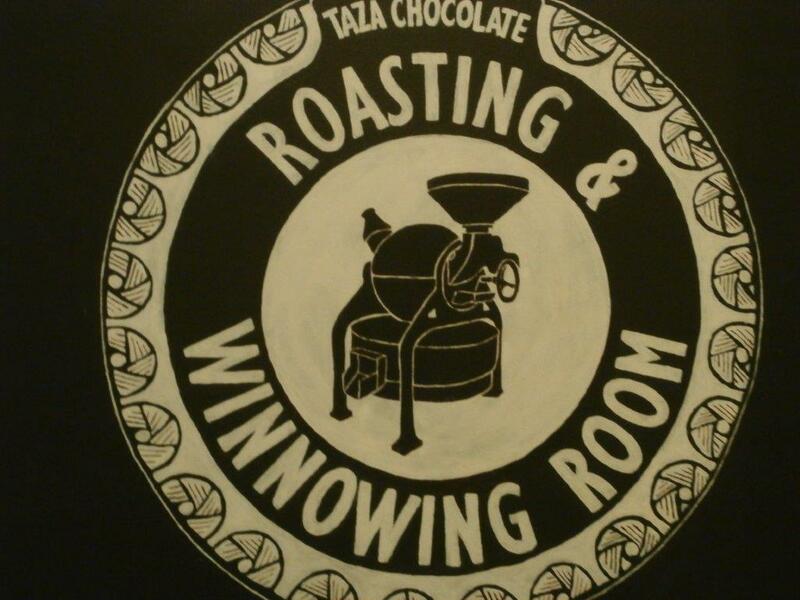 In 2007, Alex acquired his own roasting and winnowing machine and moved Taza Chocolate into its existing location. 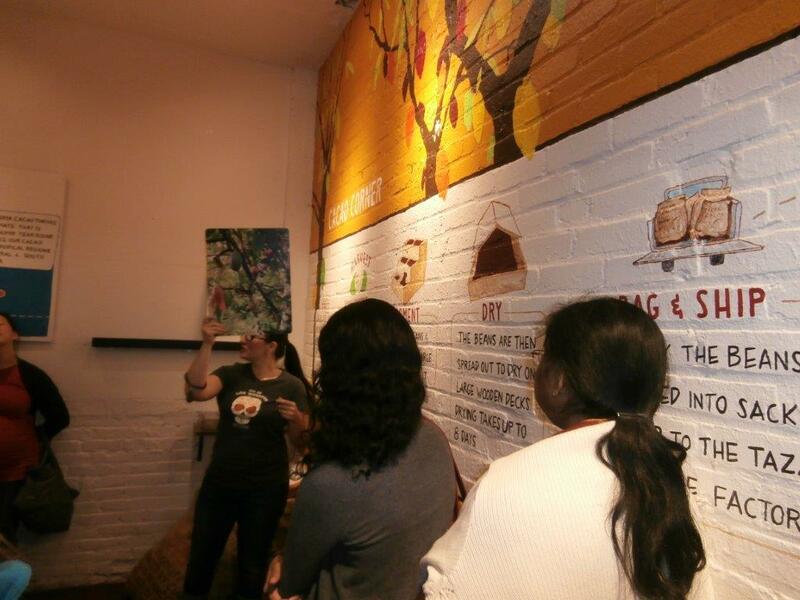 Standing against the Cacao Corner's yellow-painted brick wall, adorned with a schematic of the cacao-harvesting process, Krysia used photo boards to illustrate the harvest. She explained that Taza is more than just a fair-trade company: it uses direct trade which abides by all fair-trade practices, and it buys directly from farmers. In fact, Taza pays farmers 30% more than the market price for cacao in order to keep their loyalty and maintain good relations with them. After donning hair and beard nets, we proceeded into the roasting and winnowing room. The winnower shatters the cacao beans and blows off the shell, leaving cacao nibs. We sampled these — very bitter. Taza lightly roasts the beans at 233°F to foster the fruity complexity of the flavors. Last year, Taza processed 100 tons of beans with the two machines located in this room. Krysia extolled the benefits of cacao, which contains antioxidants, raises serotonin (a neurotransmitter that can act as an anti-depressant), lowers bad cholesterol, and has good fats. Next we walked to the shipping and receiving room. Depending on their level of expertise, between one and three people operate each wrapping machine. One person feeds naked chocolate into the machine while another one or two ensure that the wrapper is correctly glued and that expiration date is not crooked. Each wrapping machine handles 50 bars per minute—43,000 bars per week. Back in the Cacao Corner, we removed our hair nets and looked through glass windows into the production room, also known as the "hot room" because of its 85°F temperature. While we did not see much production in the hot room, a production video illustrated the process. The beans are ground until they have a texture resembling that of peanut butter. The chocolate liquor drips off the grinding stone. Krysia pointed out the overhead stainless steel pipes, referred to as "chocolate plumbing." Organic cane sugar is mixed in with paddles, and then the chocolate crisscrosses through the plumbing into the white holding tank. Flavors such as ginger and pepper are added. A unique feature of Taza's chocolate-making process is that many of their mix-ins, such as almonds, peanuts, and vanilla beans, are ground with the chocolate, exposing their additional flavors throughout the chocolate bars. We also learned that chocolate is antiseptic. When Taza finishes making a flavor, it cleans the machines and plumbing by flushing them with plain chocolate. The chocolate scrub of the recently completed flavor is then bagged and reprocessed into chocolate bars when the company makes that flavor again. After we had tasted a few chocolate samples, we peered through the windows at the back of the retail store. In the round vintage copper candy pans that we saw, chocolate tumbles to create a sheen on the outside. 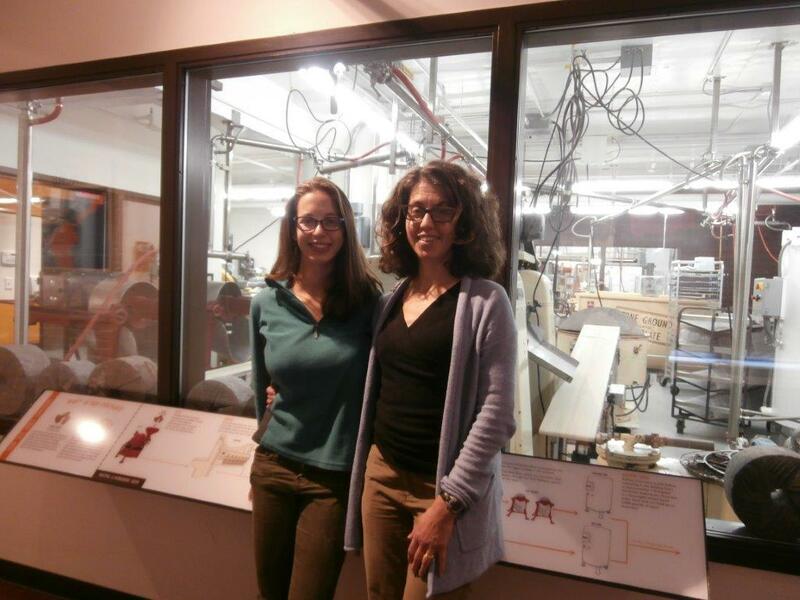 Our tour lasted one hour, summarizing the bean-to-bar process, which takes three days. The store, which offers many samples, sells a wide variety of chocolate flavors. Taza's blog has some great snapshots from the 2016 cacao sourcing season in Guatemala.